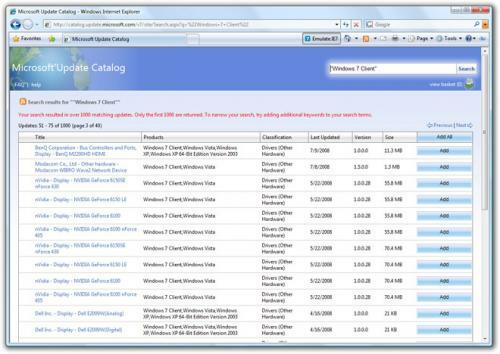 Windows 7 Client and Windows 7 Server drivers on Microsoft’s Update Catalog - the online library of drivers which Windows uses to automatically install. 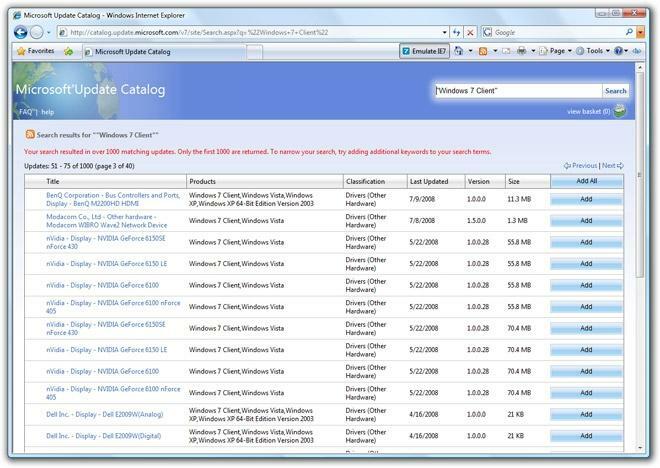 A simple search for “Windows 7 Client” reveals more than 1000 drivers already available. These drivers range from the big brands from Nvidia, ATI, Intel and Broadcom to even miscellaneous display drivers. Whilst it is true all drivers approved after June 1 should have been tested on Windows 7, most of these drivers date back to early 2007 suggesting most drivers have just been carried over from the latest WHQL release. With updates in one hand and drivers in the other, can you say beta test? Last edited by SaT on Sat Sep 13, 2008 1:47 pm, edited 2 times in total. WSUS is for Updates/Service Pack/Tools/Drivers and so on. For Microsoft Windows, Microsoft Office, and other microsoft products. so WSUS is more like a controlled Microsoft Update right? Yes, you can select to download wich type and how you download. Or only download updates (and push them to the machine automatically) for only the programs installed and type of machine (for a dell machine, dell updates and for an compaq, compaq updates). And off course other updates service packs/tools too. For those who have never heard of WSUS before. Basically you use it to download updates for all the machines you need on a network, and the clients are re-configured to have their automatic updates locked to this server instead of Microsoft's. Now your WSUS Server distributes the updates to all the machines instead of each machine using loads of bandwidth to download every update individually from Microsoft.